The SEO Realty design team uses its years of design and search engine marketing experience to build professional web sites for Real Estate Agents and companies in the real estate industry. Our Real Estate web sites are built for maximum search engine ranking performance. Our copywriters help you develop content and wording that appeals to potential clients. And our exciting custom designs can give your business an updated, professional image. If your web site is under-performing, contact us for a FREE web site evaluation today. 3CityHomes uses our exclusive Realty web site design with original real estate content. Do you have invisible pages? If you have a real estate site with an MLS search function, then chances are your pages are invisible to search engines. You see, MLS/IDX providers that supply the results to your search do so in a number of different ways. They either have you link out to their site where the search is actually performed or they let you include their search function in a framed page on your web site. Framing a search result page on your web site may seem to be a convenient way to provide real estate listings to your site visitors. But frames and web site usability do not mix well. 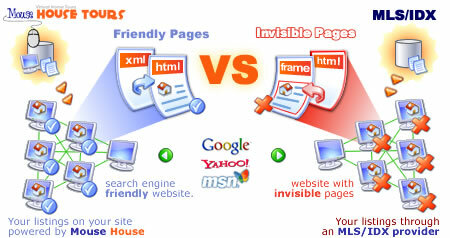 Do you know that a web site built in frames is invisible to search engines? Your listings that are displayed on a framed page are invisible. And you are losing the majority of your potential audience just for the mere fact that the search engines cannot see your site. Invisible pages do absolutely nothing for you especially when you are trying to showcase your featured real estate listings. Adding your real estate listings to your site is really quite simple. Together with Mouse House Tours, Inc. we've created a new way to add your real estate listing to your site that are 100% visible and search engine friendly. This means that a search engine can come into your site, see your featured real estate listings and ranks them in the search engine for buyers searching for specific properties in your area. Here is an illustration showing the difference between SEO Realty's Search Engine Friendly Real Estate Agent web site versus frame provided by a local MLS provider. Web page with a home tour. Or Real estate listing. Search Engine spiders or robots that visit your site. Users that visit your site. 1. A search engine ( ) will enter a web site. Once a search engine gets into your home page it will then follow the links in your web pages ( ). 2. Once a search engine comes into a search page it can go no further. a. Because a search engine cannot fill out a form and b. It won't be able to read the framed search results even if it could fill out a form and submit it. This makes all your real estate listings ( ) invisible or unfriendly ( ). 1. A search engine ( ) will enter a web site Once a search engine gets into your home page it will then follow the links in your web pages ( ). 2. Instead of finding an unfriendly search function the search engines ( ) will find links to pages with your individual home tour ( ) on it. These home tours are being fed to your site via an XML feed ( ). With SEO Realty exclusive web design, your data from the XML feed is converted into a completely friendly HTML page ( ). No tricks, just a perfectly optimized page with your real estate listing on it. If you have 10 featured listings ( x10) that means you've just added 10 pages to your site which are optimized for the keywords that users search to find your specific listing. This means you can grow your site, better optimize your site for the search engines, and attract more buyers via the search engines and make more money!